Do you eat Edamame? Perhaps you've tried it as a precursor to sushi, but never thought you could make it at home. These nutritious little soybeans are pretty tasty. But if you can boil water, you can literally make edamame. Whether you have fresh Edamame from your CSA share, or frozen, it is pretty easy. 1. Choose a pot about twice the size as your bag of edamame. 2. Fill said pot halfway with water. 3. Boil the water. Turn burner to low. 4. Rinse edamame in colander, if fresh. Leave the colander in the sink. 5. 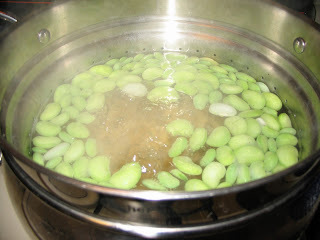 Add edamame to boiling water. Go check your email. Put on your slippers. Sort out the junk mail. (any activity you like for about twenty minutes. 6. Drain the edamame, and shake off excess liquid. 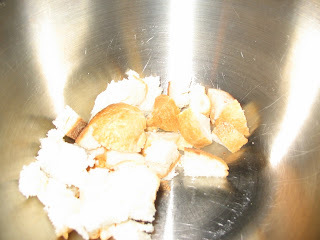 Serve in a bowl liberally sprinkled with salt (preferably large salt crystals, like kosher salt flakes). 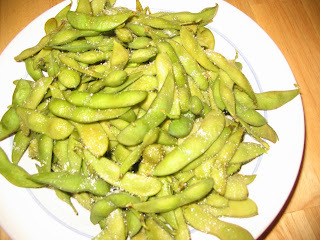 Eat the edamame by squeezing the little beans out of the pods into your mouth. They are very addictive, but yet healthy. High in protein, fiber and Omega 3. 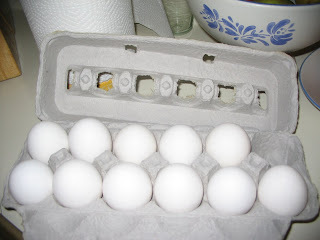 Check out other fun posts at Shannon's Works For Me blog carnival. 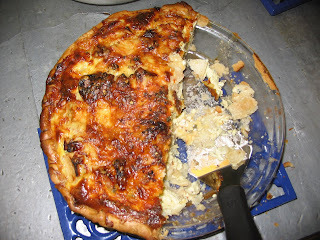 I started putting apple in quiche about three years ago, and LOVED the way it turned out, so have been doing it ever since. 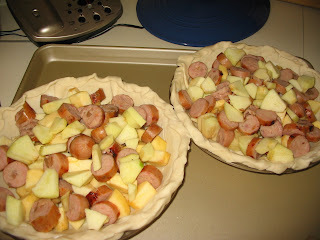 Apples are complimented especially well with sausage and some variety of cheddar cheese. 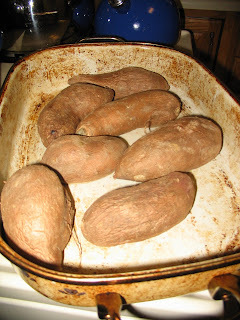 Place the now lukewarm peeled sweet potatoes in your mixer (or a big bowl). Mash them. Add some cinnamon, nutmeg, milk and molasses. 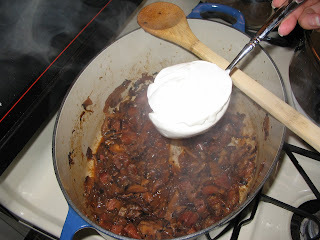 Once it is nice and creamy, scoop into a casserole dish. 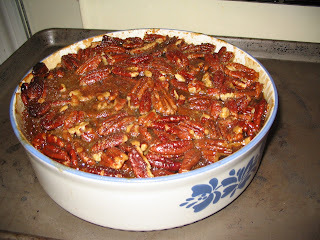 To make the topping, melt 1/2 stick of butter, and mix with brown sugar (about 1/2 cup), a dash of salt and a cup of pecans. 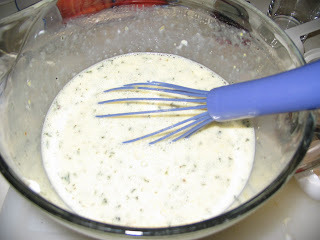 Pour this mixture on top, evenly distributing the pecans with your spatula or spoon. 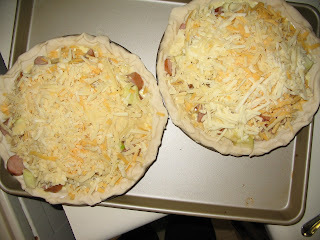 Bake at 375 for about 30 minutes - until hot and bubbly in the center. This is NOT the same as the slow-cooked-all day miracle that is shrimp and grits. But it was pretty tasty. 5. 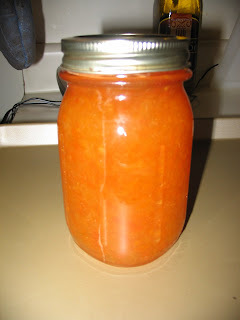 Using marmalade from a jar. 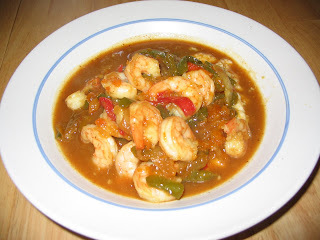 (ok, if you factor in the time MAKING marmalade, this would be 500 minute shrimp and grits. But that was back in March. It doesn't count). 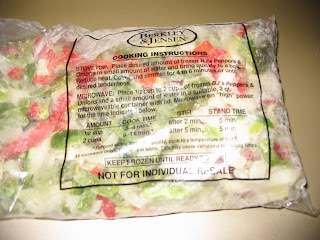 Microwave the frozen onions and peppers until they are cooked. 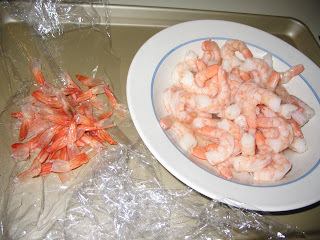 Meanwhile pull the tails off the shrimp and set aside. 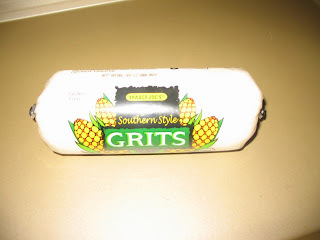 Open the tube of cooked grits, and pour into a bowl. The grits go into the microwave after the onions and peppers. 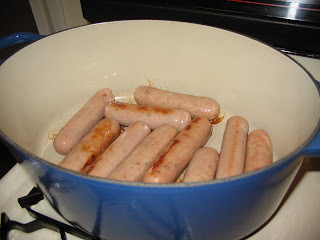 In a pot, pour about a cup of white wine, 1/2 pint of marmalade, cajun seasoning (a tablespoon? 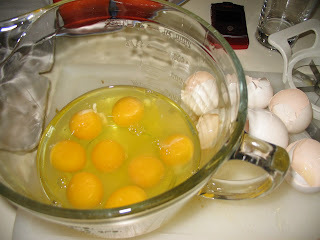 ), a tablespoon or two of molasses, and bring to a boil, then immediately turn down. 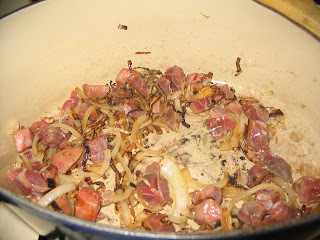 Add pepper/onion mixture and keep stirring occasionally. Shred some cheddar cheese, and mix into the grits. 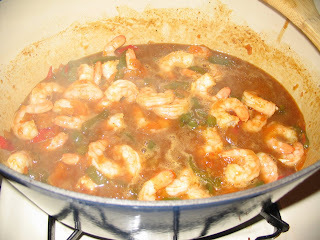 Add the shrimp at the last second - just long enough to warm the shrimp all the way through. My sister showed me a REALLY neat way to get the sticky condensed coffee residue off the bottom of a glass coffee pot, without any residual smell from harsher cleaning chemicals. Into the room temperature coffee pot, throw a tablespoon or two of salt and about a dozen ice cubes. Start swirling. As the salt melts the ice it will be very easy to swirly, but yet abrasive enough to get all those little bits off. It would also work for a glass pitcher or glass lined thermos. Works for me! My CSA share this week included fresh lima beans. I've never cared for them much. I remember swallowing them like pills as a child. But I thought I should give them a fare try. First, start a pot boiling with water for your pasta. Send your children or husband out to shell the lima beans. I soaked some dry mushrooms. 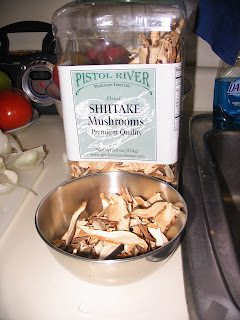 Dry mushrooms are a great thing to have in your pantry, because they last for years, and can be used in small quantities. 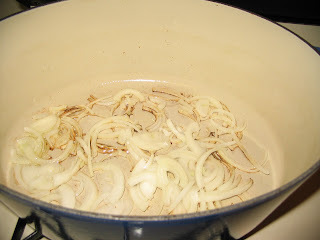 Pre soak them to add like a dish to this - just cover with warm water. If adding to soup, you can throw them right in. 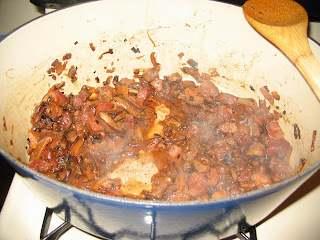 I added about a cup of white wine to the onion mixture, as well as the reconstituted (but drained) mushrooms. Boil off about half the liquid from the wine. 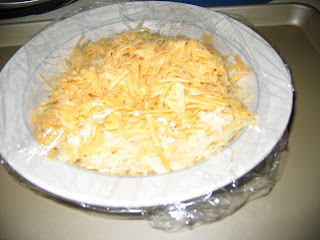 and some shredded cheese. I used some parmesan, some asiago and a little bit of Chevre from my cheese drawer. 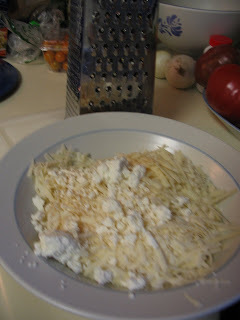 You can't see it, but I grated fresh nutmeg on top of the cheese as well. 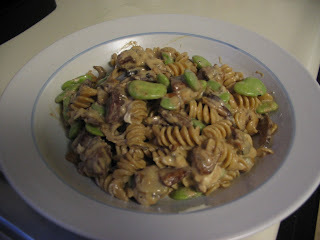 Drain the pasta and beans, and stir into the creamy onion mixture. Serve with a fork! I'm very sorry that this mixture didn't show how PRETTY this dish was, with the vibrant light green of the beans. 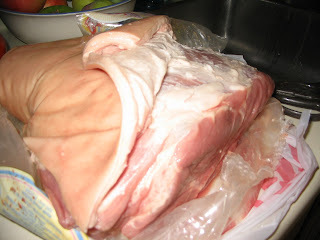 1 picnic pork roast (sometimes called a fresh ham) - mine was about nine pounds. 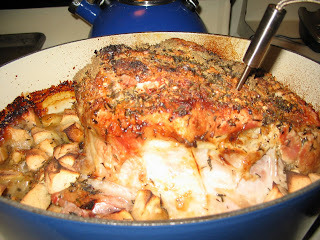 When better than during pouring rain to make a classic comfort food like a roast? Remove the pot from the heat. Add around the roast a jar of applesauce (if you don't have homemade just make sure to use one that is just apples -not sweetened or spiced). 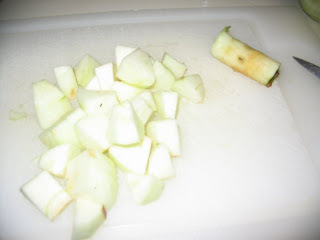 I happened to have three granny smith apples I had peeled this morning for something else, so I added them as well. 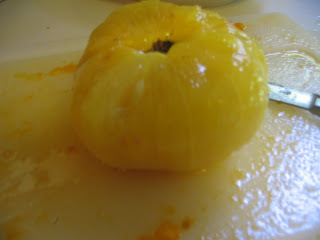 I normally add carrots and/or parsnips, but I didn't have any parsnips, and my carrots were too slimy for consumption. 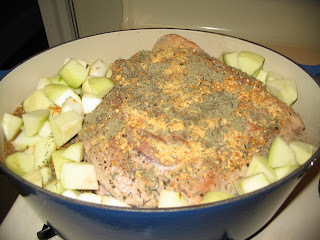 On top of the roast add a GENEROUS amount of black pepper, salt (if you've never done this before add WAY too much, and it might turn out right), rubbed sage, thyme, garlic powder and onion. Sometimes I throw in whole garlic cloves and a chopped onion, but today I did not. 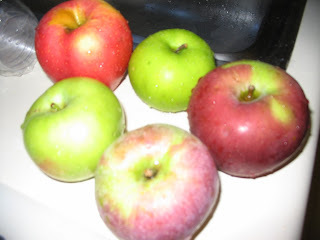 Pour some apple cider vinegar over the roast and around the edges. Roast in the oven until at least 144 degrees. If you want to follow the stricter US government rules, go all the way to 165, but I take no blame for your dried-out roast. From my research I'm comfortable with 145. If you live in a developing country, however, with less stringent rules about animal feed, you might want to err on the side of caution and use the higher temperature. 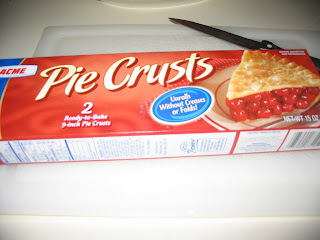 Slice long, thin slices with a bit of the salty crust on each plate. Incredible! I wish this were smell-o-vision for your sake. Did you buy a little more corn than you can eat this week? Or maybe your coworkers are bringing in the fruits from their tomato vines? "Put it up" for winter! Corn: to prepare sweet corn for the freezer: use a serrated knife to saw down the edges of a corn cob (stand the corn on end). Gather the golden nuggets into a air tight container (Tupperware, freezer proof canning jar, etc). 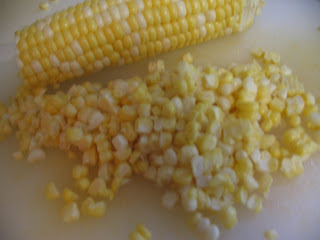 The kernels will be wonderful for soup later - especially a crab-corn chowder! Plunge them into boiling water for just one minute. Pull them out with a slotted spoon, and wait five minutes so you don't burn your fingers. But then it will be easy to peel away the peel. 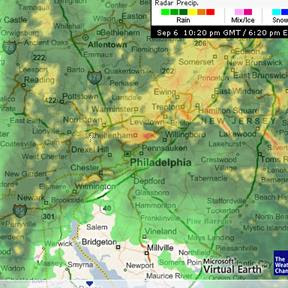 Don't look now! 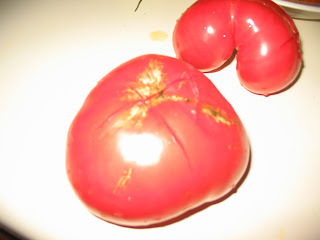 Naked tomato!! 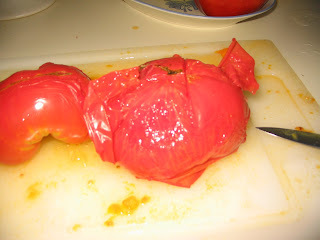 Chop the tomato and pack tightly in a plastic container (leave head room for expansion). 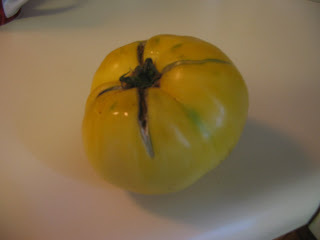 Obviously you won't be able to use the thawed tomatoes for a perfect summer burger in the dead of winter, but they are healthy addition to stew or soup in February. 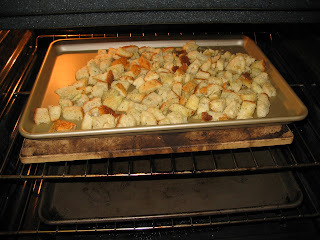 Pour in a couple of tablespoons of olive oil (or melted butter) and toss until each piece has at least a bit of oil. At this you can add seasoning. Salt is a must. 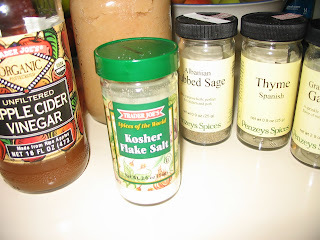 Other things you might add (just one or two): pepper, paprika, chili powder, thyme, oregano, garlic salt or garlic powder, powdered parmesan, rosemary. Bake at 400 or 450, but don't leave the kitchen. I ended up letting them cook about five minutes on one side, pushed them around with a heatproof spatula, and then another five minutes or so. You want them to be lightly browned, but mostly just dry. 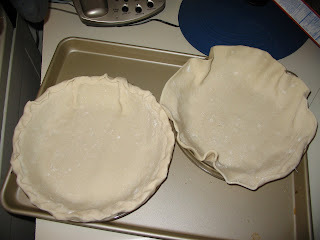 Let them sit out for a couple of hours to COMPLETELY cool. Store in a plastic bag or airtight container. Still enjoying a plethora of juicy, fragrant tomatoes. The type one just dreams about in February. 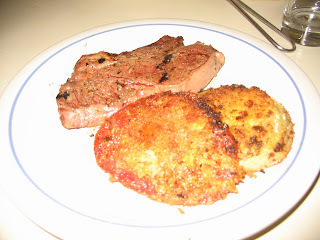 I've heard of fried green tomatoes, but never fried ripe tomatoes - so I decided to give it a try. 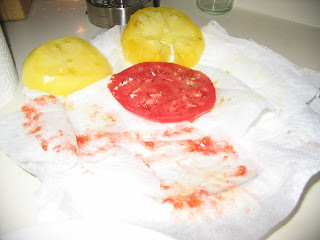 Rinse and slice tomatoes into nice thick slices. Layer slices on paper towels to drain excess moisture. Pat the top dry as well. beat together one egg with a splash of water. Preheat a pan to medium-high. 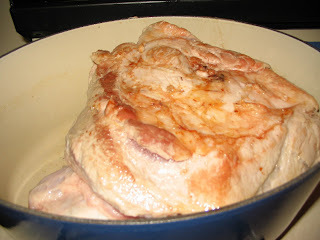 I used olive oil as my fat - enough to coat the whole bottom of the pan with a thin layer. mix together bread crumbs (I prefer panko), a couple tablespoons of flour, salt, pepper and possibly other seasoning (I added a bit of ancho chili powder). 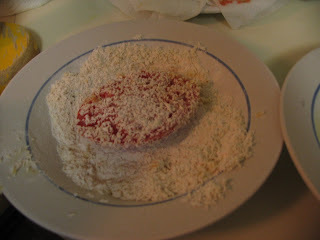 Dip a slice of tomato in the egg mixture, then dip both sides in the crumb mixture, and into the frying pan. Repeat with other slices until pan is full. Wait about five minutes and fry other side. It turned out pretty well. Because fresh tomatoes are softer, you'll need a spatula (not just tongs) to get the tomatoes out of the pan. I served with a piece of steak. 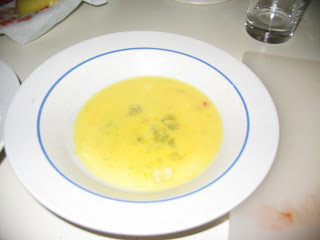 The red and yellow color added visual interest to the plate.